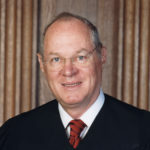 Supreme Court Justice Anthony Kennedy was secretly negotiating with Donald Trump about his replacement, even as he was casting major pro-Trump votes that were out of character with his own judicial record. This comes on top of earlier revelations that Kennedy’s son played a key role at Trump’s favorite Russian money laundering bank. We’re now looking at a full blown scandal that’s getting uglier by the hour. NBC News is now backing off from its earlier implication that Anthony Kennedy only agreed to retire if Donald Trump specifically picked Brett Kavanaugh, and is now reporting that Kennedy provided Trump with five names that would be acceptable to him. Brett Kavanaugh was the only conservative name on the list, so Kennedy would have known that Trump could only pick Kavanaugh. These negotiations reportedly began months ago. This means that Kennedy was secretly negotiating his retirement with Trump while he was casting the swing vote on issues like Trump’s Muslim Ban. While Kennedy has sided with conservatives on fiscal issues, he’s often sided with liberals on civil rights issues like gay marriage; his vote in favor of the Muslim Ban was out of character. If Kennedy had voted against Trump on the Muslim Ban, at a time when he was negotiating with Trump over his potential replacement, it likely would have prompted the vindictive Trump to break off those negotiations. Kennedy would have known this – meaning that his final votes can be seen as fully corrupt. If anyone were tempted to give Anthony Kennedy the benefit of the doubt about the corrupt nature of this secret deal, that goes out the window within the context of the fairly straight line that can be drawn from Kennedy to his son to Donald Trump to Russian money laundering to the Trump-Russia election rigging conspiracy. Kennedy’s legacy is clearly ruined; the only question is whether he’ll end up facing criminal charges. Follow the money.